May 4th – 6th – Let’s Fiesta! Grab your sombrero and get ready for a fiesta. Mexican games and dances will be held all weekend long! Come enjoy some Margarita’s and Mexican food along with a Mariachi Band at Benderz Bar “N” Grill on Saturday night! Campsites are $35.00 per night. May 11th-13th – Mother’s Day Mania! What better way to celebrate Mother’s Day than taking her camping! There will be opportunities to make mom a gift all weekend long with numerous games to play with her. Campsites are still only $35.00 per night! The store will be open with limited inventory. Get a free cup of coffee for all Mom’s Saturday & Sunday morning at the store. May 18th – 20th – Everyone Needs A Hero!! River Bend would like to honor all military personnel, police officers, firefighters, and nurses with proper ID to a free campsite this weekend. Thank you for all of your hard work and dedication and enjoy a nice relaxing weekend. 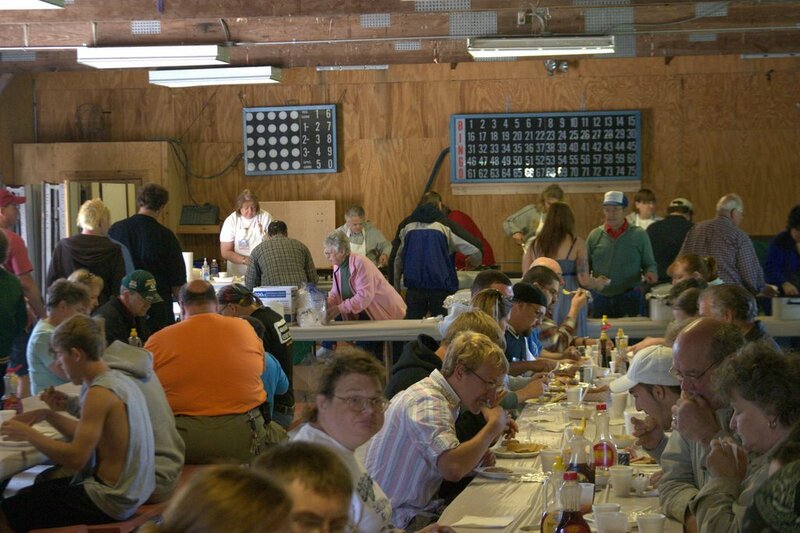 River Bend’s famous Bingo, bags, and horseshoes come back this weekend! May 25th – 28th – Memorial Day Celebration! Let’s get this season started!! The waterpark is up and running and the staff is ready to start the 2018 camping season. Karaoke Friday night at Benderz Bar “N” Grill. Come to the pavilion Saturday and Sunday evening for a DJ! Sunday morning the Fundraising Group will be serving up their Pancake Breakfast at the pavilion. After you eat check out the craft fair from 9:00am-2:00pm next to the pavilion. Welcome to the River Bend Family Olympics. There will be all sorts of traditional Olympic Games to be held this weekend to put your agility to the test. Adults 21 and over may participate in our first ever Beer Olympics! No need to fear, there will be plenty of beer here. Bring out all of your loved ones and enjoy a beautiful weekend. Don’t forget the glow parade at 9:00pm, and a DJ at the pavilion. June 8th – 10th – We Survived the Flood! I pledge my love, to the Bend, that we almost saw go under. And to the members for which It stands, one campground, under management, indestructible, with loyalty and friendship for all. Enjoy survival games all weekend with family and friends. Come to the pavilion on Saturday and enjoy a potluck dinner. Share stories and memories from 2008 with those who went through the same experience. After a fun-filled Saturday, head down to the pavilion for some night time entertainment. It’s all about you, dads! Gather your family and enjoy the activities around the park! Show us your best moves in a belly flop contest! Join us in the Activity Center to make your dad a Father’s Day card! Don’t forget, all Dad’s get a free coffee in the store Saturday & Sunday morning. Join us Saturday night for a Glow Parade at 9:00pm, and a DJ at the Pavilion! June 22nd – 24th -Pirates or Princesses? Ayyyyy me mates! Grab your sweet princess and let’s go digging for gold. Kick off your weekend with some Karaoke Friday night at Benderz. Make a group and build your own pirate’s ship out of cardboard and duct tape on Saturday. All you princesses can come down to the Activity Center and enjoy a spa day. Get your hair braided, nails painted, and get pampered by our staff. Saturday night dance your heart out to the band, “Crossfire”. June 29th-July 1st – Aloha! Hawaiian Weekend! Bring out your grass skirts & Hawaiian shirts! Saturday we will be keeping with the Luau tradition with a pig roast pot luck meal. Limbo contest for all ages, hula hoop contest, music, and for the adult’s great frozen tropical drinks. Tons of crafts including Tiki Torch making will be held all weekend! Show us your best Hula Dance moves at our Luau Saturday afternoon. Special appearances by talented performers Saturday night at the pavilion! July 6th– July 8th – Made in America: 4th of July Celebration! Let’s see the Red, White, and all sorts of True Blue friends this weekend. Games, crafts, and events will be plentiful. Kick off your weekend with Karaoke Friday night at Benderz. Saturday enjoy our annual 4th of July parade, park wide! DJ & Fireworks Saturday night at the pavilion. July 20th – 22rd – Let’s Battle, Water War’s! Grab your water guns and super soakers and gang up on the River Bend Staff. Come to Benderz Friday night and enjoy some Karaoke. This annual tradition has been enjoyed by everybody with all sorts of fun water games all weekend! You’ll need an extra pair of clothes, because you’re sure to get soaked! Head down to the pavilion Saturday evening for a DJ and glow parade. Please remember: No water balloons at any time this weekend. Failure to abide will result in a fine. Human Bubble Ball is back, join us for some competitive fun! This weekend will be full human size games including: Jenga, Twister, and River Bend Member “Guess Who”. That’s not all, board games galore in the Activity Center all weekend! Dance your way to the pavilion on Saturday night to enjoy our National Act: “Wayland”, with special guests “Bad Habitz”! From carnival games to special attractions there will be fun to be had by all. Come sing your heart out Friday night at Karaoke at Benderz. Join us Saturday during the day for some small games including: ring toss, face painting, dunk tank, popcorn, and more! Saturday evening come to the pavilion to enjoy a special guest appearance for all ages, and then participate in the glow parade. Yeehaw! Puff those lips and give us a good spit in our seed spitting contest. After that, line dance your way over to the Activity Center for a little hoedown. Saturday afternoon all Adults 21 and over are welcome to partake in our 2nd annual Hick Slip at the Activity Center. Numerous other games and crafts will be held all weekend long. Saturday night come enjoy the one and only National Act: “Craig Campbell” with “Drew Baldridge” as the opening act. From pigs that race to ducks that waddle this is the place to be. Head to Benderz Bar Friday night for some great Karaoke. Join in on some fun games of Run Rabbit Run and Monkey Tag. Special performances, acts, and appearances will be happening throughout the day on Saturday. Don’t forget to check out our special animal exhibit with all sorts of creatures. End the day with a glow parade and DJ in the pavilion. You won’t want to miss it! Peace and love to all! On Saturday @ 3:00pm, you won’t want to miss the chance to make your own Tie Dye shirt. Bring your own, or purchase one from us! Feeling crafty? Come on down to the Activity Center and make a beaded safety pin! Don’t forget to join us in the Pavilion for “Mike Valentine and the Heart Beats”. August 31st – September 3rd – Labor Day Festivities! You’ve worked hard all summer, now it’s time to relax and have some fun. The weekend starts with Karaoke Friday night at Benderz Bar “N” Grill. Saturday we will have our annual softball game but this year it will be between Owners & Seasonal Campers. Glow parade and DJ Saturday night. Sunday starts with the famous Fundraising Pancake Breakfast. After you fill up on some great food walk on over and check out the craft fair from 9:00am-2:00pm. Finish your holiday weekend off Sunday night at the pavilion with a DJ. September 7th – 9th – Park Appreciation!! This weekend we thank all of our Members, Seasonal and Overnight campers for a wonderful season. River Bend would not be the same without you! It is also the beginning of fall camping. The annual appreciation pot luck & mystery auction will be on Saturday afternoon in the pavilion. Help us out and bring a dish to pass. Good fun for everyone. Campsites are reduced to mid-week pricing now through October 8th. September 14th – 16th – Bonfire Blast!! There is still plenty of great camping to be had in the fall. Come to Benderz Bar “N” Grill on Friday for some great Karaoke! On Saturday afternoon, bring your best cookins’ and come to the chili cook off also at Benderz. Best chili wins! Saturday night bring your family & friends to the pavilion parking lot for a bonfire! Don’t forget your hotdogs, s’mores, and pudgy pies! September 21st – 23rd – Fun In The Fall! 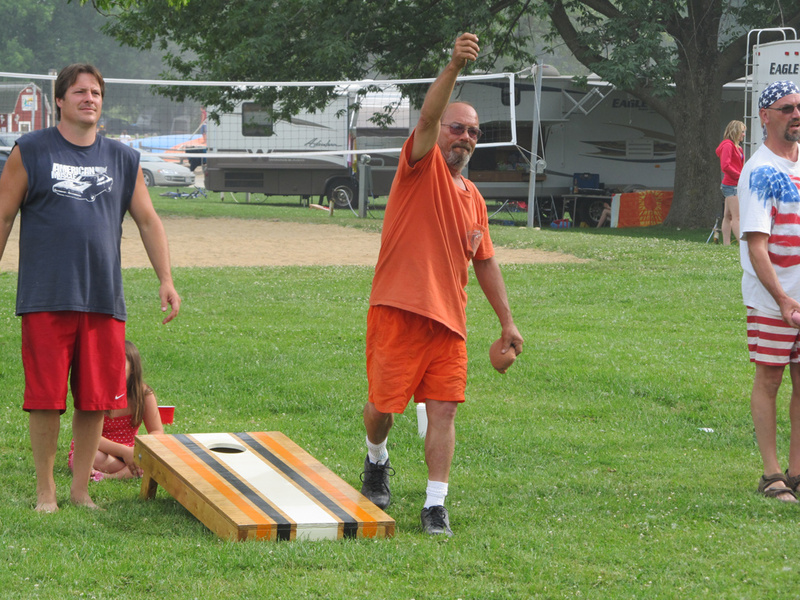 Crafts, bingo, horseshoes, bags tournament, and more to fill your Saturday schedule! Enjoy the weekend by relaxing around your campfire. Stop up at Benderz Bar “N” Grill Saturday night for Karaoke!! Our mid-week camping rate will continue through October 8th. Are you brave enough? I guess we will find out! Hope you don’t scare people away with your singing at Karaoke Friday night at Benderz. There will be a haunted house on Friday & Saturday nights both weekends! Join us for pumpkin painting on Saturday, with a chance to win a prize for the best painted pumpkin for each age group. Get your costumes on, and join us for a mini costume party, followed by Trick or Treating for both kids and adults! The fun doesn’t have to stop, Adult Costume party & DJ at Benderz Bar “N” Grill Saturday night. Prizes for best costume! October 12th – 14th – Fall Color Frenzy!! Fall camping has never been better! Keep warm by a fire, and watch the leaves change colors. Hungry? Stop in at Benderz Bar “N” Grill for some football and pizza!! Campsites are only $25.00 per night!!! October 19th – 21st – Until Next Season, Final Farewell! Say your final goodbyes….just for now! This is the final weekend water is on. Time to bring on the winter months, and say goodbye to the friends made throughout the camping season! Join us for an early Thanksgiving pot luck at Benderz Bar “N” Grill. Bring a dish to pass and enjoy some football! !